Nintendo Switch Smartphone App Coming Soon | Nerd Much? Although it wasn’t a feature announced during last night’s Nintendo Switch presentation, Nintendo has confirmed that a Nintendo Switch Smartphone App is coming soon. 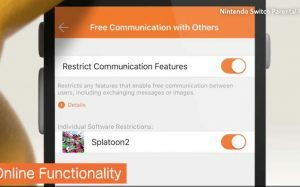 In an official listing for Splatoon 2, one of the features touted notes “Smart Device Support”, and in the description of that feature, Nintendo says there is an “upcoming smartphone application for the Nintendo Switch system”. We don’t know exactly what sort of functionality the Nintendo Switch smartphone app will have just yet, but Nintendo released a video just a couple hours ago that noted that it will have Parental Controls available in the app that will allow parents to set timers for their kid’s playtime on the Switch. Of course, we’re assuming at this point that the Nintendo Switch smartphone app will allow you to do more than just setup parental controls, but to what degree of functionality it will have is unknown. In the Splatoon 2 listing, however, it does mention enhanced matchmaking and “voice chat options”. Hopefully, the Switch app will offer similar features to what Sony and Microsoft offer with their smartphone apps, such as the ability to purchase games and queue them on your console. We’ll know more soon. For more of the latest Nintendo Switch news and game trailers, stay tuned to Nerdmuch.com.